Yes, there’s the 12 Days of Christmas but I’ve started too late. Had to tend to an Engagement Party for Middle Chicken. She’s finally marrying Lawyer Boy. Yay, right? So instead of 12 days of gold rings, dancing ladies and swans doing whatever, we’re launching into 7 Days of Giving. Mostly ‘cuz I’m swamped with work and thinking seven days I can actually accomplish. First up: Great Books. Here are some selections for your honies to add to their reading lists this year. “My grandmother Dorothea always said that it was a combination of beauty and strength that made Southern women ‘whiskey in a teacup,’” Reese writes on the book’s website. 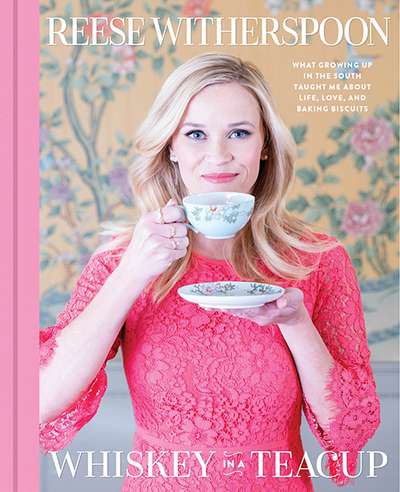 “We may be delicate and ornamental on the outside, she said, but inside we’re strong and fiery.” The book is called Whiskey In A Teacup, and its’ famous Southern girl author is Reese Witherspoon. Yes, the actress, who is a major book club girl. Read this one and create a better life. The Southern kind. Chrissy Teigen’s Cravings: Hungry For More, is selling out all over. Maybe because someone finally combines laughter and cooking. Recognizing we didn’t all get the Ina gene, Teigen gives easy-to-follow directions for yummy food you’ll actually eat. Funny and easy? I’ll take it! Why not harken back to the classics that made you want to be “that” girl. How about Scout from To Kill A Mockingbird. In this political climate, could we not use a heavy dose of someone doing the right thing for a change. And, perhaps, reminding us all, that we were once brave girls who wanted to change the world? It’s what classic, American lit is supposed to be, non? From the author of Game of Thrones, there’s Fire & Blood: 300 Years Before A Game of Thrones. The reviews note a “gripping narrative.” It’s a historical text and a favorite of any House of Targaryen fan–whatever that is. You know if you have this guy on your holiday list. Is your darling more cerebral? How about bestseller, The President’s Club: Inside The Worlds’s Most Exclusive Fraternity. Nancy Gibbs and Michael Duffy, editors at Time Magazine, wrote this one that delves into the last 13 presidents; their partnerships, dealings, secrets, rescue missions and rivalries. Who doesn’t love a good rivalry with their history? John Grisham’s The Reckoning. It’s in Mississippi. There’s an unthinkable murder followed by a bizarre trial and the effects on a small town. Grisham follows the same plot but it’s hard to argue with the master of the legal novel. It’s a Christmas night snuggle in front of the fire for your favorite guy.